Family Time on the Road Just Got Better. The PKG-RSE3HDMI DVD entertainment system is perfect for your passengers. 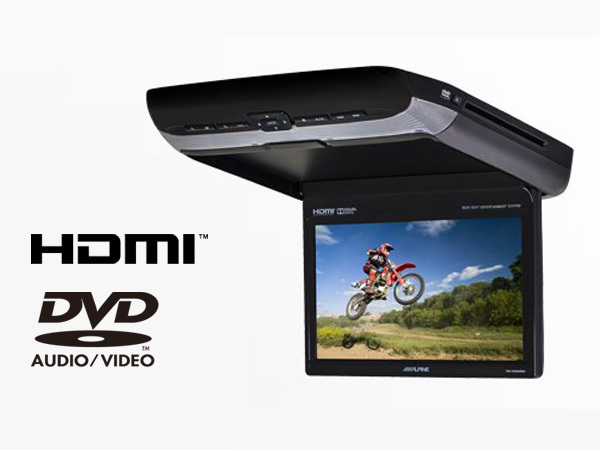 Your passengers can enjoy a quality picture through HDMI, their favorite DVD or movie device on any road trip. Dual direct HDMI inputs allow for video content to be played from any HDMI-enabled device, such as a smartphone with an HDMI adapter. The system is equipped with one AUX input to connect to external sources such as an iPod®, iPhone®, iPad® or game console (requires third party cable, sold separately). Plug in a USB device to play videos with the most common format such as AVI, MPEG, MP4, MOV, FLV, RMVB, MP3, WMA, AAC, and JPEG. The PKG-RSE3HDMI’s controls are located on the shroud’s top panel for easy access by the kids. If they would rather use a remote control, the RUE-4159 remote control comes with the system for convenient access. Two pairs of headphones are also included so the kids can enjoy their content without being distracted. The PKG-RSE3HDMI rear seat entertainment system consists of a 10.1-inch flip-down monitor with a built-in DVD player and dual HDMI inputs. Its durable, automotive-grade DVD/CD mechanism is designed for in-vehicle challenges such as vibration and heat, to deliver reliable playback quality. The LED WSVGA monitor features 1.84 million pixels for brilliant picture quality. The PKG-RSE3HDMI is the perfect complement to an Alpine 9-inch, 8-inch, or 7-inch in-dash Restyle dash system. The Dual Zone Video Control feature on the Restyle dash systems allows the video content from the Restyle dash system to be transmitted to the PKG-RSE3HDMI’s monitor while you enjoy a different audio source in the front seat. The PKG-RSE3HDMI is designed for installation flexibility. It comes with console shroud covers in three colors (Gun Metal Black, Bright Gray, Champagne Gold), so just choose the one that matches your vehicle’s interior for an aesthetically pleasing look.